Elizabeth Taylor Cleopatra Eyes – A Simple Guide. 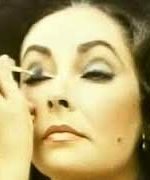 Elizabeth Taylor applying eye makeup.From the public domain film The Drivers Seat. Learn the art of 1950’s Makeup style for yourself . Instant download 1950’s makeup and beauty guides from Vintage Make-up Guide.com. A Life of beauty – Elizabeth Taylor This is our tribute to Elizabeth Taylor. An animated film, morphing iconic images from her youth to middle age.